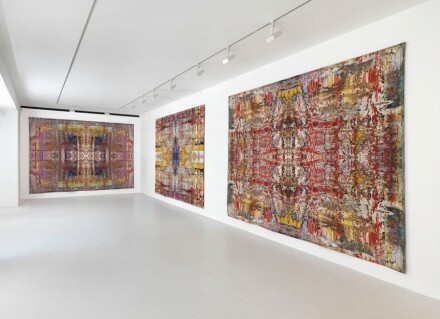 Currently on display at Gagosian Gallery’s London space on Davies Street are a series of 4 tapestries, created in 2009 by prominent artist Gerhard Richter, entitled Abdu, Iblan, Musa and Yusuf. Combining the artist’s signature style with bold new aesthetic forms, the works are based on the artist’s 1990 work, Abstract Painting (724-4). Born in Dresden, Germany in 1932, Gerhard Richter’s work has been displayed internationally for decades. His works are included in major museum collections around the world, and his most major exhibitions were held at the Art Gallery of Ontario, Toronto; the Museum of Contemporary Art, Chicago; Hirshhorn Museum and Sculpture Garden, Washington, D.C.; and the San Francisco Museum of Modern Art, as well as the Tate Gallery, London; the Deutsche Guggenheim, Berlin; the Musem of Modern Art, New York; and the Museo Nacional Centro de Arte Reina Sofia, Madrid, among others. 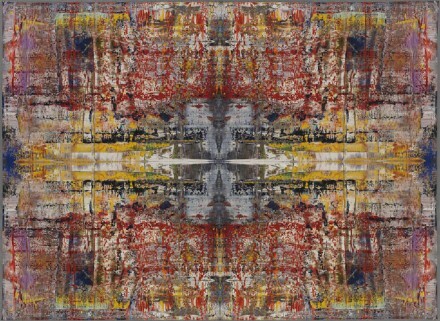 Richter’s Abstract Painting (724-4) exemplified the approach to non-representational painting that he has become known for, and in more recent years he has created other works that take earlier paintings, and reappropriate them in new ways. He has used a variety of media to appropriate his own work, ranging from prints and books to new ways of painting, using digital media to take his physical paintings and reinterpret them with modern techniques. This selection of tapestries are a continuation of this work, playing with the gaps that exists between photographic reproductions and original canvas works. The tapestries in the exhibition seem based around the same visual effects of the original painting, using the same colors and forms, while adding a new layer of dimension and texture. woven on a jacquard loom, and together the tapestries make up four quadrants of the 1990 work on canvas repeating its quadrant four times, so that the canvas is multiplied by four and woven together. The loom used to make the works is designed to take a digital image and weave a representation of the original, creating precise, kaleidoscopic versions of Richter’s original painting. Each tapestry is unique in its color scheme; for example, Abdu is composed of a splattering of blue, red, and mixed whites and yellows, while Iblan is composed of lilacs and dark blues with a white center. Not normally known for geometrically balanced works, Richter’s tapestries create a striking new perspective on the artist’s broad oeuvre as it transforms his interpretive scrapes and complexly layered compositions into a cohesive, nearly flat form. Forced to act on a single, symmetrical plane, Richter’s technique becomes caught between his own personal style, and the classical art of weaving, works that exist at multiple points in time while also working outside a fully historical context. 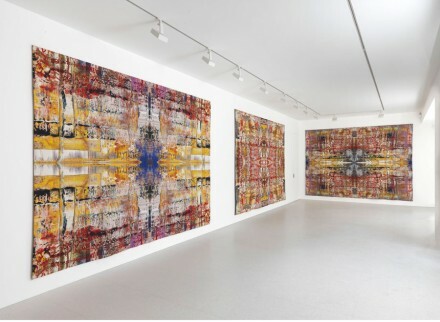 “Tapestries” will continue at Gagosian Gallery’s London Davies Street location through July 27, 2013. 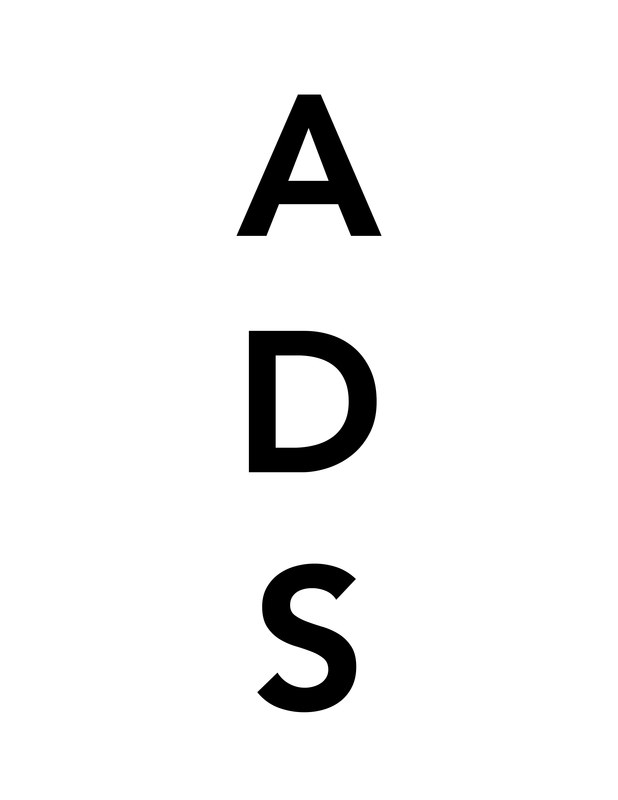 This entry was posted on Monday, July 22nd, 2013 at 4:27 pm	and is filed under Art News. You can follow any responses to this entry through the RSS 2.0 feed. You can leave a response, or trackback from your own site.